A simple parsley-based marinade adds a refreshing zest to these Green Balsamic Beef Kabobs. Use different veggies to shake up the recipe! In a high-powered blender or food processor, combine the first four ingredients. Blend until smooth – the marinade will be a lovely green color. Add the beef cubes to a large shallow dish and pour the marinade overtop. Cover and refrigerate for at least 4 hours or overnight. When you’re ready to make the kabobs, turn on the grill and preheat to medium-high (400-500 degrees F). Remove the marinated beef from the fridge and prepare to assemble the kabobs. Thread one cube of beef on the skewer, then a mushroom, then a chunk of onion (plus any additional veggies). Continue until skewer is full and repeat with remaining skewers. 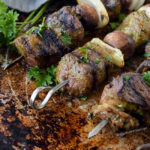 This recipe made 4 hefty kabobs for me, but you may have more depending on how heavily you load up your skewers or if you add veggies. If you’d like, you can brush the leftover marinade on the veggies, but it’s not required. Grill the kabobs on all 4 sides for roughly 2 1/2 minutes on each side. Frustrated with the meat and veggies on your kabob spinning as you try to flip them? When assembling the kabobs, use 2 skewers side by side for each kabob…and flipping is that much easier!